I love a good paper shop, or really just paper in general. I love the smell, the feel, all of it, and when you combine it with good design, it is pure happiness for me. That is what I found when I was recently introduced to Jack and Izzy. Simple design, bright colors AND perfect packaging. Jack and Izzy just launched their etsy shop where you'll find bookplates, stationary sets, birth announcements and personalized name art. Ever since I can remember, I have always loved to create. I find great pleasure and satisfaction when I'm lost in a fun project. I'm inspired by beautiful paper and vibrant colors, and I'm drawn to clean, simple designs. I enjoy pretty packages, and appreciate the timeless, endearing nature of a hand-written note. I've had the dream of designing my own line of stationary since my first experience working in the industry nearly five years ago. And it's incredibly exciting to see that dream become a reality! Today Jack and Izzy will be giving away the shops most popular seller (their amazing bookplates) to TWO winners! or a fun shape that symbolizes your child's personality? They'll add a personal touch to you or your child's library or make the perfect gift, either in the tin alone or in a favorite book from you! Which Jack and Izzy product would you enjoy most? Good Luck and Thank You Jack and Izzy! I love the monogram! But I think I'd have to go with the round illustration for all our new baby/kid books! The party pack - wowzers! So cool. Thanks for a great giveaway. I love the round illustration bookplates, super cute. The baby update cards are genius!!! i love the whale design- so precious! Love the stationary. :) Anything with a monogram has me happy. I've been looking for pretty bookplates for a long while. These are beautiful! I love the round book mono. plates. I agree, I love her designs! I have to say the Baby Update Cards are brilliant! But I wouldn't mind the bookplates. how adorable! I would love the baby announcements where you pick the scalloped illustration. So cute! The owl emblem is my favorite! I've been eyeing Jack and Izzy stationary for some time now, and while I would personally love some stationary for myself, I would pick the bookplates for my little girl. I love the bird design!! I like the baby update cards. The Baby update cards, I have a friend from Kansas whose daughter is living in NYC . I have put them in my favorites and as soon as her grandbaby is born and I know boy or girl I'm sending these to her....so cute! Thank you for showing this grandma such cute stuff! I would love to give the baby update cards to a friend due in september! I really wish I had done that for my daughter. I love the monogrammed notes, too! Perfect for my home library! I love the party packs. That would be wonderful for a party! Such beautiful products! I love the book plates!!! 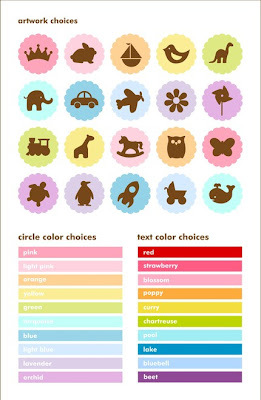 I love the personalized prints- how cute they would be in the nursery. oh, I'm obsessed with paper products! and jack and izzy only fuels the fire. love the idea of the baby update cards! I love the Baby update cards! Such a cool idea! The party pack for sure. That is an awesome prize. I just LOVE the party pack!!! That is SO perfect. Love the monograms! I'd choose the crown in pink for my daughter and the car in blue for my son, lovely! this stuff is beautiful - my personal favorite would be a monogrammed bookplate - in pink, of course! I would enjoy the Party Pack the most. Who wouldn't love a good party?! I'm a sucker for monograms! But I also love rocket ship and dinosaur. Ooooo, so many lovely choices. Pick me! I love these bookplates! A great way to teach ownership and respect for one's things by making them special! I would love the giraffe design in orange or yellow! I really LOVE the bookplates a whole lot! The party pack would also be something that I would love...sounds like a lot of others agree. Everything is beautiful! Sarah is a good friend of mine and she does amazing work. Oh boy! I would definitely choose the icons. They are so cute. I would love to do baby announcements with jack and izzy for my little boy on the way! These are absolutely darling! I would definitely choose the monogram as my kiddos are older and the cute pictures might be a little young for them. What a wonderful shop at Etsy! Thanks for sharing this. I love the personalized notecards. How fun! Wow, thanks for sharing such a cute shop. Since our little one is about 6 weeks away from arrival, I was ogling the birth announcements. Thanks! such a darling li'l etsy shop. you introduce us to the best stuff! i absolutely love the monogram bookplates and the personalized note set. oh so so sweet. and a perfect gift with that cute packaging! The personalized note set is my favorite. Love them! So cute! My daughter has a million books! I love the party packs with illustrations! I love the birth annoucements... so simple and classy. The birth announcements are a nice twist on tradition! The little owl best suits my daughter, she is such a wise, old soul. These bookplates are fabulous! I'd choose the rocking horse for my little daughter because I'm hoping that she'll develop a love of horses like her mother. Great products! Love the stationary with the little blue rocket ship. Never have enough boy stuff around here with 3 little ones. I like the monogram design, too. I LOVE the book plates with the monogram. I also think the personalized children's art is so cute. What a fun shop. Great prices too. Stationary with a monogram... I can't get enough! the personalized stationary! i love all the colors! very beautiful. I would definitely enjoy the bookplates! I love making bookplates for my girls books but it would be nice to have someone else do the designing for once! I love those party packs! The bookplates are great - thanks for the giveaway! I love the baby update cards! So great! I love her birth announcements with the scalloped illustration! all of her stuff is so simple, sleek, and lovely! Thanks for this chance to win the bookplates!! The birth announcements are precious and I need them right now to send out for my son who was born on March 20! What a great giveaway! I love it all, but their personalized prints are great. I think I'd have to go with a turtle for my son. I think the personalized childrens' print is cute. Who doesn't like to see their kids' name in print? I love the baby update cards, what a great solution to journaling our new baby's first year. I think I love the personalized note sets! Okay, this was a hard choice, but I think I like the bird picture on the book plates because I call my babies my little birds and they have sooo many books. I am drooling over those monogram bookplates. So simple and modern and gorgeous! I love jack and izzy! I would choose the fun shape design of a butterfly! Bookplates would make the perfect gift for my niece! I adore the bookplates for my daughter in college who is such a book worm! I love the personalized notecard set. There is just too many cute things to choose! I love the bookplates -- so fun! I love the elephant! So fun! oh how adorable is this. i hope i win. I love the Bookplates - You Pick Scallop Illustration! I would choose the Bookplates with the owl design for my daughters growing library. 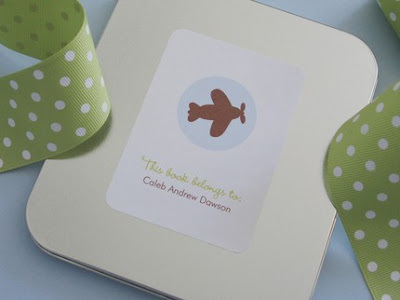 love the bookplates, party packets, birth announcements. beautiful. The Baby Update cards are such a fun idea! I love all of their items! Especially the stationary sets and the baby update cards. What a great idea. I would for sure do the monogram for my sweet baby to be, Isla. I NEED this because she is going to have so many books by the time she is born!! Beautiful! I love the bookplates. My son is a little obsessed with dinosaurs lately. As much as I love the monogram, I'm sure he'd love the dinos. I like the monograms. Love the colors! So pretty. I would love to win these stickers for myself (a teacher with countless books to label) or my son who also has tons of books. I love jack and izzy! I love the simple, clean look of her creations. I love the round illustration bookplates - especially the airplane! I would love to win the bookplate with any of the following artwork designs: the owl on yellow,the turtle on green, crown on light pink or the whale on one of the blues. I would love for my kids to have personalized labels for their books, they would love it! love the personalized note set! I L.O.V.E the personalized name art! I love the owl design...so cute!!! Love the baby update cards, love the book plates and the personalized print for the nursery. I would have a really hard time picking colors and pictures, but I loved the elephant and the whale. And also the monogram. Love it all. These are absolutely adorable!!! I love the train artwork. Great Etsy shop! I love it all! The bookplates in particular! Great work! Oh, all their products are beautiful, but how could anyone possibly resist those monogram bookplates? I love Izzy's party pack! Stationary is my favorite, theirs is beautiful. The bookplates and update cards are also wonderful. I have a set of the monogram stationary that is so beautiful I never want to use! The box is darling and is set up in my living room for all to see! I am monogram obsessed. I also love putting names in books. This is perfect. I love it all but I die for anything mongramed. All their stuff is so cute. LOVE the baby update cards! So sweet and simple! The party pack is so cute and we are getting close to a first birthday. It would be perfect! Ooh, I love the personalized note cards, but I think the book plates are still my favorite! Oh my, my daughter is such a bookworm, we'd def. put those bookplates to use! Cool products! I love the book plates with the owl. in pink of course..
Love the monogram! Also the party pack is a great idea. these colors are so great, I love the monogram too, and the little rocket image is adorable! Lo lo love the book plates with the little owl. Adorable! I love all of their stuff. Especially the scalloped personalized children's print. I love the monogram and the cute shapes. I think the pinwheel describes my little guy so well because he has just learned to blow them and loves to watch them go. love them so cute.the owl is my fav. penguin!!!! we love penguins. My husband and I were married "the year of the penguin", when all the movies came out about them, so our dear friend made us two dancing penguin ornaments for christmas, and we have been collecting beautiful ones ever since. (We are kind of snobby about it, and design in general, so we only get ones we REALLY LOVE. Don't want a ton of bad ones, you know?) These would be the best EVER to label family books! I love the bookplates! What a great shop! I love it all but the personalized name art is super cool! I am due any day now and that would be fun to have hang in the little guys room. I love the personlized stationary, you can never have to many note cards. I really like the monogram plate. So fun and graphic. Thanks for such a great giveaway! 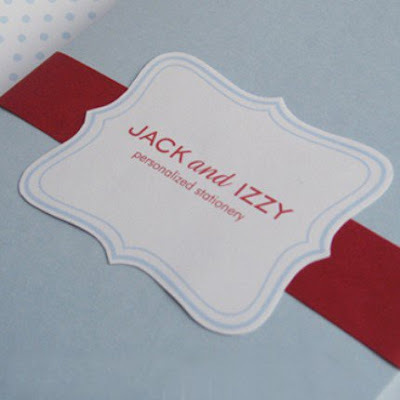 Apparently I've been living in a closet for some time now, because I have never heard of "Jack and Izzy" stationary before. They're seriously all gorgeous!!! Seeing as how I have never had a stationary set, I would have to go with the "You Pick Monogram" Personalized Note Set! I LOVE the bookplates. So simple and fresh. What a great giveaway! I love the birth announcements! I would have to go with the flower. I think anyone who loves to read would love bookplates. They're great if you share your books. Love the bookplates - I would go with either the flower or windmill for all of my daughter's books. 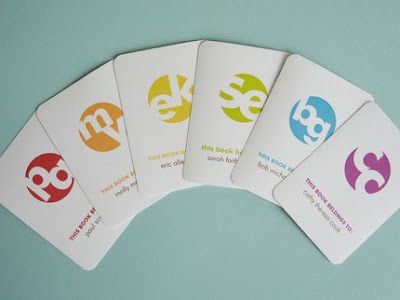 -Kristin R.
i love the personalized note cards and the monogram bookplates. my daughter is a book worm...at two years old. if it's quiet in the house, i often find her sitting in a pile of books, just reading, smiling, giggling and imagining. i love it. Monogram for sure. Simple. Wonderful. I think the baby update card and the party pack are so fun and unique. But, I really think I'd choose the bookplates! We just had our second child, even though we're really working really hard on teaching our almost 3-year-old about sharing, I think it would be fun to put those in some of his books as something special just for him! Cara Blair: I really like the monogrammed set as well. Love stationary! I love the stickers for "This Book Belongs to" How much better would that be than my messy handwriting. And then maybe we wouldn't lose so many books!! I love the birth announcements with monogram! I'll be needing some fabulous ones come August when my bambino arrives! these are beyond cute! i'm always up for good paper! I like the party pack. What a great giveaway. i love the stationery set. as i've no kids yet, i don't have much use for the baby stuff. but i could definitely see myself using the party pack too! its too darn cute! I love it all but I think I would enjoy the personalized note cards the most. The book plates are adorable too. So many fun things to choose from! I love the baby update cards. Already on my favorites :) now I just have to decide on a name for newbaby! Thanks!